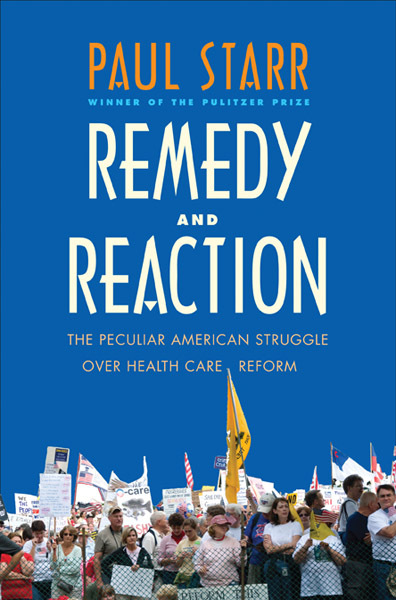 Remedy and Reaction: The Peculiar American Struggle over Health Care Reform (Yale University Press, 2013 revised edition). The Logic of Health-Care Reform, orig. ed. (Grand Rounds Press, 1992). For high-resolution PDF, click here. Revised and enlarged edition (Penguin, 1994); Introduction to the Penguin Edition, Chapter 6, and Chapter 7. "Rebounding with Medicare: Reform and Counter-Reform in American Health Care," Journal of Health Politics, Policy, and Law (August 2018). "A New Strategy for Health Care," The American Prospect (Winter 2018), 51-57. "The Health Care Legacy of the Great Society," in Norman J. Glickman, Laurence E. Lynn and Robert H. Wilson, eds., Reshaping the Federal Government: The Policy and Management Legacies of the Johnson Years (forthcoming). "Law and the Fog of Health Care," Saint Louis University Journal of Health Law and Policy 6 (2013), 213-228. TEDx talk on Supreme Court and the Struggle over Health Care Reform. "The Mandate Miscalculation," The New Republic (December 29, 2011), 11-13. Follow-up: "The Health Care Mandate Really Was a Mistake," The New Republic, January 2, 2012. "Will the Healthcare War Ever End?" Lecture (audio and video), Zocalo Public Square, Los Angeles, December 14, 2011. "The Medicare Bind," American Prospect (November 2011), 24-35. "The Next Health-Reform Campaign," American Prospect (September 2010), A3-A7. "Professionalization and Public Health: Historical Legacies, Continuing Dilemmas," Journal of Public Health Management and Practice (Nov. 2009), S26?S30. "American Medicine?s Transformation (or not): A Quarter-Century?s Perspective," Policy History Conference, May 31, 2008. "The Hillarycare Mythology" The American Prospect (October 2007), 12-18. ?Health Care?s Big Choice,? The American Prospect 10 (October 2004), 30-33. ?Health Care Reform and the New Economy,? Health Affairs 19 (November-December 2000), 23-32. "Health and the Right to Privacy,"American Journal of Law and Medicine 25 (1999), 193-202. "What Happened to Health Care Reform?" The American Prospect no. 20 (Winter 1995): 20-31. "Delivering Health Reform," The American Prospect, no. 16 (Winter 1994): 32-41. "For the Clinton Plan," The New Republic, December 6, 1993, 28-31. "The Framework of Health Care Reform," New England Journal of Medicine 329 (November 25, 1993): 1666-1672. "Bridge to Compromise: Competition Under a Budget," Health Affairs (Supplement 1993): 7-23 [with Walter A. Zelman]. "Design of Health Insurance Purchasing Cooperatives," Health Affairs (Supplement 1993): 58-64. "Healthy Compromise: Universal Coverage and Managed Competition Under a Cap," The American Prospect No. 12 (Winter 1993): 44-52. "The Politics of Health Care Inequalities," in David E. Rogers and Eli Ginzberg, eds., Medical Care and the Health of the Poor (Boulder, CO: Westview Press, 1993), 21-32. "The Middle Class and National Health Reform," The American Prospect No. 6 (Summer 1991): 7-12. "Health Care and the Boundaries of Politics," with Ellen Immergut, in Charles Maier, ed., The Changing Boundaries of the Political (Cambridge University Press, 1987), 221-254. "Health Care for the Poor: The Past Twenty Years," in Sheldon Danziger and Daniel Weinberg, eds., Fighting Poverty: What Works and What Doesn't (Harvard University Press, 1986), 106-32. "The United States: A Social Forecast" (with Theodore Marmor) in Jean de Kervasdoue, et al., eds., The End of an Illusion: The Future of Health Policy in Western Industrialized Nations (University of California Press, 1985). "The Laissez-Faire Elixir," The New Republic, April 18, 1983. "Medical Care and the Pursuit of Equality in America," in President's Commission for the Study of Ethical Problems in Medicine and Biomedical and Behavioral Research, Securing Access to Health Care, v. 2, Appendices, 2-22. "Transformation in Defeat: The Changing Objectives of National Health Insurance, 1915-1980," American Journal of Public Health 72 (January 1982): 78-88. "Medicine and the Waning of Professional Sovereignty," Daedalus, Winter 1978. "Medicine, Economy and Society in Nineteenth-Century America," Journal of Social History, Summer 1977. "The Politics of Therapeutic Nihilism," Working Papers for a New Society, Summer 1976; reprinted in the Hastings Center Report, October 1976. "The Undelivered Health System," The Public Interest, Winter 1976. "The Doctors' Discomfort," The New Republic, June 10, 1975. "The New Medicine," The New Republic, April 19, 1975. "A National Health Program: Organizing Diversity," Hastings Center Report, February 1975. Testimony before the Joint Economic Committee, Hearings, 103d Cong., 1st sess., September 14, 1993. Testimony before the Committee on Labor and Human Resources, U.S. Senate, in Achieving Effective Cost Control in Comprehensive Health Care Reform, Hearings, 102d Cong., 2d sess., December 17, 1992, pp. 170-183. Testimony before the Committee on Finance, U.S. Senate, in Comprehensive Health Care Reform and Cost Containment, Hearings, 102d Cong., 2d sess., May 6, 1992, pp. 36-38, 389-393. "The Republican Health-Care Unraveling: Resist Now, Rebound Later," The American Prospect (Spring 2017), 5-7. Health Reform's Next Test," American Prospect(January-February 2014), 5. "The Supreme Court Decision as a Political Opportunity" The Democratic Strategist (July 9, 2012). "Supreme Surprise: Health-Care Reform Survives Another Near-Death Experience," American Prospect, June 29, 2012. For It Before They Were Against It: Would a Conservative Court Ruling Against Healthcare Reform Really Kill off Cherished Conservative Ideas?" Zocalo Public Square, December 13, 2011. "Three Roads from the Supreme Court" American Prospect (May 2012), 3-4. "Their Preexisting Condition" [Title in print edition] "In 2012 Obama and Romney Would Both Bear the Burdens of Health Reform" [Web title]Washington Post (and other papers), November 27, 2011. "The Opt-Out Compromise," American Prospect, March 9, 2010. "A Health Insurance Mandate With a Choice," New York Times, March 3, 2010. "Last Chance for Health Reform," American Prospect (April 2010), 3. Underrating Reform," American Prospect, March 2010. "Moving Up the Pace of Reform," TPM Cafe, Dec. 21, 2009. "An Alternative to the Mandate," TPM Cafe, Dec. 18, 2009. "What Is in the Health Care Bill," TPM Cafe, Dec. 17, 2009. "Deal or Die on Health Care," American Prospect, December 15, 2009 (web only). "Averting a Health-Care Backlash," American Prospect, December 8, 2009 (web only). "Fighting the Wrong Health Care Battle," New York Times November 30, 2009. "Faster, Please" The American Prospect (December 2009), 3. "Health Care Reform Gets a Booster Shot," American Prospect Online, September 11, 2009. "Obama to Press Forward with Health Care Reform" The Takeaway (WNYC radio), September 2, 2009. "In Sickness and in Health," Interview, "On the Media," National Public Radio, August 21, 2009. "Sacrificing the Public Option," American Prospect Online, August 19, 2009. "Perils of the Public Plan" The American Prospect (July-August 2009), 3. With follow-up debate with Robert Kuttner and Robert Reich, June 29, 2009. "Hillary's Own Plan,"Prospect Online, September 24, 2007. "Hillarycare Mythology [sidebar]: Did Hillary Threaten Democratic Senators" Prospect Online, September 24, 2007. "The Homeless and the Public Household," The New England Journal of Medicine 338 (June 11, 1998). Review of Theda Skocpol's Boomerang: Clinton's Health Security Effort and the Turn Against Government in U.S. Politics, Contemporary Sociology(March-April 1997):150-153. "Twice Bitten," Hospitals and Health Networks, November 20, 1996. "Damage Report, " The American Prospect no. 28 (September-October 1996): 6-10, plus a note on President Clinton's August 22 signing of the Health Insurance Portability and Accountability Act. "Look Who's Talking Health Care Reform Now," New York Times Magazine, September 3, 1995. pp. 42- 43. "Reform is Dead. Long Live Reform," The New York Times (Sunday op- ed), September 4, 1994. "Why the Clinton Plan Is Not the Enthoven Plan," Inquiry 31 (Summer 1994), 136-140. "Alliances for Progress," The New York Times (Sunday op-ed), March 6, 1994. "Health Alliances are a Good Choice," Chicago Tribune, December 7, 1993. "Detoxifying the Debate," The American Prospect No. 13 (Spring 1993): 122-126. "The Ideological War Over Health Care," The New York Times, February 2 (? ), 1992.
Review of Robert Jay Lifton, The Nazi Doctors, in The New Republic, November 24, 1986. "Commencement Address," Bulletin of the New York Academy of Medicine, March 1986; given at Albert Einstein College of Medicine, June 4, 1985. Comment ("On the Origins and Cure of Warped Incentives") in Mancur Olson, ed., A New Approach to the Economics of Health Care (American Enterprise Institute for Policy Research, 1981). Review of Bruce Vladeck, Unloving Care: The Nursing Home Tragedy, in The New York Times Book Review, April 16, 1980. "Changing the Balance of Power in American Medicine," Health and Society (Milbank Memorial Quarterly), January 1980. "Kennedy's Conservative Health Plan," The New Republic, June 9, 1979. "Controlling Medical Costs Through Countervailing Power," Working Papers for a New Society, Summer 1977. "A Coming Doctor Surplus?" Working Papers for a New Society, Winter 1977, reprinted in the Washington Post and other papers.